"You can't kill and talk at the same time." An article published this week in Yediot Ahronot was headlined, "Israeli officials: Starve Iranians to stop nukes," and reported, "Iran's citizens should be starved in order to curb Tehran's nuclear program, officials in Jerusalem said Wednesday ahead of Prime Minister Benjamin Netanyahu's upcoming trip to Washington." The article quoted an unnamed official as saying, "Suffocating sanctions could lead to a grave economic situation in Iran and to a shortage of food. This would force the regime to consider whether the nuclear adventure is worthwhile, while the Persian people have nothing to eat and may rise up as was the case in Syria, Tunisia and other Arab states." On April 18, 2007, John McCain, that mavericky steward of the self-described "Straight Talk Express", held a campaign event at Murrells Inlet VFW Hall in South Carolina, where he was asked when he thought the United States might "send an air mail message to Tehran." His reply began with him singing "Bomb bomb bomb, bomb bomb Iran" to the tune of The Beach Boys' "Barbara Ann." In fact, Iranian officials have not only never threatened to attack Israel militarily, but have also specifically spoken out against such a possibility. For instance, on June 4, 2006, Iranian leader Ali Khamenei declared during a speech outside Tehran that "Iran is not a threat to any country and everyone knows this fact about Iran," a point he reiterated in the same speech: "We are not a threat whatsoever to the world and the world knows it." Khamenei went on to insist, "We will never start a war. We have no intention of going to war with any government." Later that summer, President Ahmadinejad himself said in a speech, "Iran is not a threat to any country, and [Iranians are] not in any way a people of intimidation and aggression." In September 2007, Ahmadinejad was asked explicitly by the Associated Press whether Iran "would ever make a first strike against Israel." He replied, "Iran will not attack any country," and insisted Iran has "always maintained a defensive policy, not an offensive one" and has no interest in territorial expansion, something Israel could never seriously claim. At a news conference during the 2008 D8 Summit in Kuala Lumpur, just months after Clinton's comment, Ahmadinejad told reporters that the Zionist enterprise is "inherently doomed" to failure and, as such, "there is no need for Iranians to take action." He also assured the press, "You should not be concerned about a new war." Nevertheless, former IDF Brigadier General and Knesset member Ephraim Sneh told a panel at the AIPAC Conference on June 2, 2008 that the Iranian government "must be eliminated" through indigenous regime change borne partly out of economic hardship. Sneh suggested that "in order to accelerate" such regime change, "[r]eal effective sanctions" must be imposed on Iran. "Sanctions that would make it impossible," he said, "for the regime to govern, to run the economy, to feed 70 million hungry people." The crowd cheered. Two days later, the morning after clinching the Democratic presidential nomination, Senator Barack Obama also addressed AIPAC. He declared his intention "to find every avenue...to isolate the Iranian regime, from cutting off loan guarantees and expanding financial sanctions, to banning the export of refined petroleum to Iran" and bragged about having introduced legislation in 2007 "that would encourage states and the private sector to divest from companies that do business in Iran." The intention of these measures, in addition to imposing "unilateral sanctions that target Iranian banks and Iranian assets," Obama said, was to "tighten the squeeze on the Iranian regime. A Chicago radio show host on October 11, 2011 asked Congressman Mark Kirk - one of the most vicious warmongers when it comes to Iran - whether the imposition of more and more draconian sanctions don't constitute collective punishment on a civilian population. "Are you really going after the government of the country, or are you taking food out of the mouths of the citizens?," Ron Magers asked the congressman. Kirk answered: "It’s okay to take the food out of the mouths of the citizens from a government that’s plotting an attack directly on American soil," capitalizing on the groundless hysteria following the absurd allegation that a used-car salesman in Texas was tasked by the Iranian leadership to assassinate the Saudi ambassador to the United States. Speaking at the Halifax International Security Forum on November 6, 2010, South Carolina Senator Lindsey Graham, who has long been an avid proponent of launching an illegal attack on Iran, called upon the United States to "neuter that regime." Despite stating that "the last thing America wants is another military conflict," Graham suggested the U.S. military should "not to just neutralize their nuclear program, but to sink their navy, destroy their air force and deliver a decisive blow to the Revolutionary Guard." A year later, Graham repeated this wishlist during a November 13, 2011 appearance on Face The Nation. "You have to neuter this regime. You have to destroy their air force, sink their navy, go after the Revolutionary Guard and try to get the people of the country to overthrow the regime," he told Bob Schieffer, continuing, "We need a regime change. If [they] get a nuclear weapon, the world is going to go into darkness." Three days later, on November 16, 2011, when he was still in the GOP race, John Huntsman told CNN's Piers Morgan that sanctions alone won't force Iran to abandon its nuclear program, explaining, "You can tighten the noose in ways that will make life a lot more difficult from an economic standpoint. But my sense is that their ultimate aspiration is to become a nuclear power, in which case sanctions probably aren't going to get you there." On December 7, 2011, perennial neocon warmonger Lee Smith wrote in Tablet Magazine that, with regard to Iran, the United States "has the military capacity to turn the lights off across the country, cripple the economy, and bring the regime to its knees—by bombing its oil and natural-gas fields, its ports, power plants, reservoirs, and dams as well as its nuclear facilities. The fact that the United States has the power of life and death over 80 million Iranians may not make the rest of the world comfortable. But there’s no use lying about it." The clear fact that all 16 U.S. intelligence agencies, Defense Secretary Leon Panetta, Joint Chiefs of Staff chairman Brigadier General Martin Dempsey, Director of National Intelligence James Clapper, Director of the Defense Intelligence Agency Ronald Burgess, Israeli Defense Minister Ehud Barak and current Israel intelligence estimates have unanimously concluded that Iran doesn't even have a nuclear weapons program -"illicit" or otherwise - seems not to faze Menendez. Considering that the Lieberman-Graham resolution, which Menendez so adamantly supports and has co-sponsored, essentially calls for war against Iran to prevent it from reaching what is now termed "nuclear weapons capacity," it can be assumed Menendez is currently filling out enlistment papers for his children. 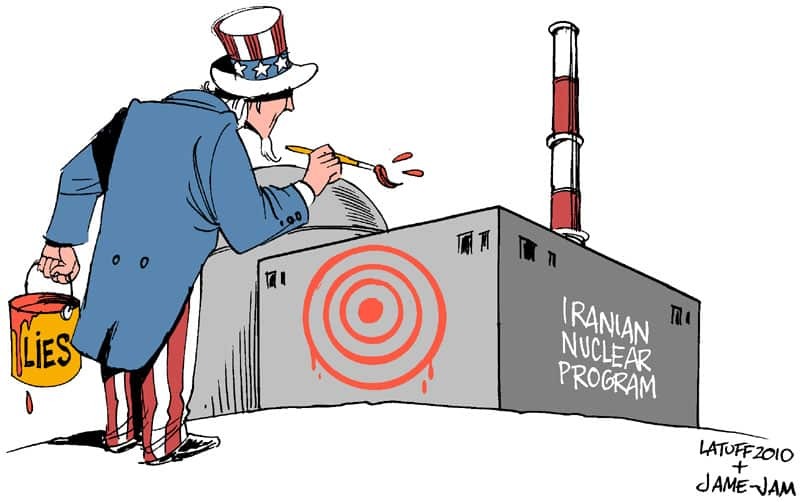 On March 1, 2012, Jordan Weissmann, associate editor at The Atlantic, wrote a piece entitled, "How to Choke Iran Without Killing the World Economy," lauding the punitive destruction that U.S. sanctions have wrought on the Iranian economy and trade. Weissman quotes only Foundation for the Defense of Democracies Executive Director Mark Dubowitz, a rabid neoconservative and advocate of harsher and harsher sanctions, to bolster his praise and himself writes, "The sanctions can't be too light, or Iran will just continue on its merry way enriching uranium." Weissman's dismissive and adolescent sneer ignores the simple fact that Iran has every right to enrich uranium and that all enrichment in Iranian nuclear facilities is monitored closely by IAEA inspectors who consistently confirm that no enriched material has ever been diverted to a weapons program. Still, Weissman gleefully reports that Iran "has been resorting to barter deals, such as offering oil for rice and bananas" in order to feed its citizens and that the U.S. should be "happy" about that development. Despite admitting that "Iran does not yet have a nuclear weapon and is not yet in a position to obtain a nuclear weapon without us having a pretty long lead time in which we will know that they are making that attempt," Obama nevertheless was proud of following through on his 2008 threat to "tighten the squeeze" by inflicting such economic, diplomatic and political hardship on Iran that, in his words, have put the Iranian government in "a world of hurt." Such nonchalant talk and campaign trail knee-slappers about "annihilation" and "obliteration," of murder and war crimes, of collective punishment and forced deprivation, of tightened nooses - the execution of a death sentence - and of deliberately hurting a nation of 74 million human beings, along with chest-thumping boasts about destroying the internationally safeguarded nuclear facilities of a sovereign country, would be unequivocally condemned were it directed toward the United States or its allies. March 3, 2012 - Omitted (inexplicably) from the above post is any mention of William Morgan Shuster's 1912 book The Strangling of Persia, the blistering indictment of the early 20th Century imperial interference of Russia and Great Britain in Iran during the aftermath of the Iranian Constitutional Revolution of 1906. Shuster, an American lawyer and customs collector, was hired by the nascent Iranian parliament (Majlis) as treasurer-general of Iran in order to help bring financial stability and independence to the post-revolutionary nation laden with debt accumulated by the now-deposed Qajar Dynasty and owed to Russia and Britain. The two superpowers, wary of the prospect of fiscally-responsible and politically-autonomous Iran, staunchly opposed his appointment. Within less than a year, Russia had sent troops to occupy northern Iranian cities, militarily attacked the Iranian Parliament building in Tehran, and Shuster was forced to resign his post. Upon his return to the U.S., he wrote his scathing criticism of imperialism and how powerful empires seek to subjugate foreign countries in their endless campaign for hegemony (oftentimes by crushing democratic movements). March 3, 2012 - In today's New York Times, Emanuele Ottolenghi, a senior fellow at the perennially fear-mongering D.C. think tank Foundation for Defense of Democracies (which essentially serves as a thinly-veiled extension of AIPAC and its ilk), advocates for more "crippling sanctions that will bring Iran’s economy to the brink of collapse." Ottolenghi admits that this will only be possible with "complete United Nations-imposed oil embargo enforced by a naval blockade, as well as total diplomatic isolation." Anyone who claims this is a way to avoid war ignores the clear fact that this kind of naval blockade would be an act of war. As Jonathan Schwarz reminded us back in 2008, "Israel's original justification for taking over Gaza in 1967 was that Israel was being subject to a blockade," quoting directly from "the official Knesset history of the Six Day War." Egyptian President Gamal Abdel Nasser blockaded the Straits of Tiran on May 21st and 22nd to all shipping from and to Eilat; the area was open to Israeli ships under UN supervision since 1957, and Israel repeatedly stated that such a blockade will be considered as casus belli (justification for acts of war). In conclusion, Ottolenghi - in all his appalling glory - insists that Iranians must understand that "the West is willing and capable of inflicting devastating harm" to Iran. But this disgusting nonsense is unsurprising considering the source, a warmongering think tanker who repeatedly references "Iran’s nuclear pursuit," its "long and labyrinthine path to nuclear weapons," and its "nearly 30-year pursuit of nuclear weapons." Clearly, reality doesn't sit well with this one. March 6, 2012 - Obama held a press conference today in which he gloated about his administration's ability to "mobilize unprecedented, crippling sanctions on Iran. Iran is feeling the bite of these sanctions in a substantial way." He also presaged more to come, insisting that "sanctions are going to be even tougher in the coming months, because they're now starting to affect [Iran’s] oil industry [and] their central bank." Month by month, sanctions and other activities will undermine the regime's political and financial base — squeezing the Iranian leadership and tempting it to take rash actions that would trigger a devastating response. Ignatius then makes the following analogy: "The situation resembles a hunting trap that gets tighter as the prey tries harder to escape." As such, the United States, its Western allies and Israel are cast as predators and Iran the prey, afflicted with sanctions that "bite deeper" and foreign actions that put Iran's head-of-state in "a double bind." Furthermore, Ignatius revels in the Obama administration's "way of increasing the cost of Iran's actions, short of war," in which he fantasizes that "[d]efense-related research facilities could be disrupted; financial and other commercial records could be scrambled," adding, "These may sound like extreme options, but they're just the non-lethal ones." March 12, 2012 - Jacob Kamaras of JointMedia News Service reports today that hawkish Democratic Congressman Brad Sherman of California - who in the has long been a leading proponent of punishing Iran with harsher and harsher sanctions for not bending to U.S. diktat regarding its legal nuclear program - is hoping to impose even more sanctions on Iran in the coming months. Brad Sherman (D-CA) — ranking member of the House Subcommittee on Terrorism, Nonproliferation and Trade — told JointMedia News Service during a private meeting at the AIPAC conference that tougher sanctions than the current ones are needed. Sherman is quoted as saying, "Hard, strict sanctions that impact everyday life in Iran could encourage its people to choose between regime survival and its nuclear program." Just a few days ago, Sherman - along with another AIPAC-devotee Mark Kirk (R-IL) - introduced new sanctions legislation in the Senate and explained that his goal of fomenting regime change in Iran will be aided by implementing "pedal to the metal" sanctions that "harsh and immediate" against the Islamic Republic. Such talk is not surprising coming from Kirk, who last year literally said, "It’s okay to take the food out of the mouths of the citizens" of Iran because of the alleged threat Iran poses to the United States and its friends. "Iran is playing for time," Sherman told The Hill, adding a mouthful of regurgitated propaganda with no basis in fact. "They'd like to have a nuclear weapon, and they will go all out to develop a nuclear weapon, unless they believe the efforts to create a nuclear weapon endanger their survival." For good measure, The Hill reported, "Sherman said the United States must continue to impose the toughest possible sanctions until Iran gives up its nuclear weapons program." Speaking at the same AIPAC meeting as Sherman, former AIPAC president and current Massachusetts State Treasurer Steven Grossman told JointMedia that he believes "squeezing Iran little by little, in the oil area, in the natural gas area, in the importation of refined petroleum products" is a worthwhile strategy to compel Iran to capitulate to U.S. and Israeli demands and relinquish its inalienable national rights and sovereignty. Grossman, however, lamented that not all countries - namely Russia and China - were abiding by the sanctions regime. "Squeezing the ability of the central bank of Iran to do business in international markets," he said, "[will] never going to work unless everybody participates." April 3, 2012 - During an obsequious television interview with CBC's Peter Mansbridge on April 2, Defense Secretary Leon Panetta spoke approvingly of the U.S. sanctions regime against Iran, just days after President Barack Obama - under the auspices of the National Defense Authorization Act - imposed what the press termed, "tough, new sanctions" intended "to slow Iran's oil exportation by targeting the financial institutions that purchase the country's oil." Despite the fact that Panetta clearly states that, according to "the best intelligence we have now," Iranian officials "have not made the decision to actually produce a nuclear weapon" and affirming that "there's consensus on that in terms of the intelligence community," he insists that the "diplomatic and economic sanctions" levied against Iran are intended "to isolate them and to make very clear to them that until they change the way they behave, they're going to continue to be isolated. And they're not going to be welcomed to the family of nations." Panetta boasted that "there is evidence that these sanctions are hurting, that it's impacting on their economy, it's impacting on their ability to govern themselves. It's impacting on their relationships with other countries. It's impacting on their position in the world, and we are weakening Iran as a result of that. We're isolating them and I think we just have to keep that pressure on them until they recognize that they have to change their ways." In other words, Do what we say, or suffer. No wonder Israelis and Americans often speak about "shared values." April 9, 2012 - White House spokesman Jay Carney gloated over the Obama administration's record of having implemented "the most punitive sanctions that have ever been levied" against Iran. He added that these measure are "the kinds of sanctions that have resulted in hardship for Iranian people. Their economy has definitely suffered, and it has caused some chaos for them in general." What the Iranian people are being punished for, however, is never much explained, considering the Iranian nuclear facilities are under strict IAEA safeguards, monitoring and inspection and Iran has never been found to have breached its commitments under the Non-Proliferation Treaty. What a noble government the United States has, one that deliberately forces Iranians to suffer in order to protect Israelis from nuclear weapons that don't exist. "[O]ur focus must be on rapidly and dramatically ratcheting up sanctions, without the glaring exceptions that we now have, in order to put our boot on the throat of this dangerous regime." May 21, 2012 - The United States Senate once again voted in favor of a new round of unilateral sanctions on Iran. Once again, Bob Menendez led the charge of stupid statements by threatening Iran. "Provide a real and verifiable plan for the complete dismantling of your nuclear weapons program, or Washington will further tighten the economic noose," he said. Considering Iran has no nuclear weapons program, such a statement could not be dumber. While sanctions are one part of convincing the Supreme Leader that the costs of pursuing this weapon outweigh any perceived benefit, Senate Republicans insisted that the Senate pass nothing less than the president's commitment that all options are on the table, in order to prevent any contrary perception that silence on the use of force would have created. Joining the chorus, Republican Sen. Mark Kirk said, "Today the U.S. Senate put Iranian leaders on notice that they must halt all uranium enrichment activities or face another round of economic sanctions from the United States." Truth be told, few things probably scare the leadership in Tehran less than being threatened and put on notice by 100 bought-and-paid-for United States Senators. To that end, his arguments grow increasingly complex, involving a near-term confrontation with Syria and what he is sure will be a military strike on Iran late this summer, “an air and sea campaign from hell,” he tells an audience in Sumter. A large screen at the Third Army command center in nearby Shaw Air Force Base seemed to back him up on that. It broadcast a multicolored map of Iran with its air defenses demarcated in loud, red circles. June 20, 2012 - During a joint "Conversations on Diplomacy" interview with Hillary Clinton, former Secretary of State James Baker told Charlie Rose that an Israeli military attack on Iranian nuclear facilities would have the effect of "strengthening the hand of the hardliners in Iran," continuing, "I mean, you don't want to do that. They're having troubles now. The sanctions are not complete yet. We want to squeeze them down more. But they're having an effect. And the government is having some problems, and you don't want to lose all that." This summary of items is overwhelming but excellent for being so. You've made your case and I am going to forward your post to friends, advising them to simply browse your list, dipping in to read here and there for representative reads, then consider the length of the entire piece. Thanks for keeping an accounting. If only information like this was read by people in the United States, instead of the ceaseless and sadistic war prop. Shameful. Implementing collective punishment-- sanctions, embargoes--is an act of Aggressive War and a War Crime. But since when does the United States bother over Law it can't fashion into a weapon? Iran is not the problem. 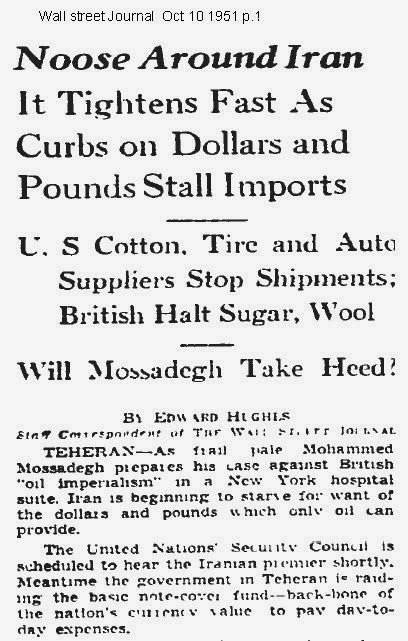 A century ago, W. Morgan Shuster wrote a book, The Strangling of Persia. Then, it was the British and Russian monarchies doing the strangling. Today, it is Zionist and Neo-conservative (Neo-Trotskyite) totalitarians. wow, nima. you are amazing. so proud of you. thanks for all of your hard work. Well,under this circumstances if Iran is not working out to get the Nuclear Bomb they must be really stupid. But we all know they are not stupid. North Korea rewarded building nuclear bomb and they get freebies and goodies if they promise as a good boys not to build and carry on more test. Build a bomb if you don't you will get invaded like Iraq Afghanistan. Then you will get aid & more not to carry on testing building Nuclear bomb. As my cyber-friend, Rob Payne, points out in the blog "Dead Horse," ordinary Iranians and ordinary Americans have much more in common than their idiot "leaders." Wish the media would get that through their heads, but then that would be unpatriotic, wouldn't it? and immediately posted it on my facebook page. You have done an excellent synthesis of scattered pieces of the propaganda blitzkrieg that has been unleashed on the world and the American people. It would be nice if you take on the task of creating a Persian version of it, for Iranians who in or out of Iran, have a poor command of English language. It would help put things in perspective. They need to know that the US military/industrial complex is not their friend. Dr. Paul Sheldon Foote gets it right again. 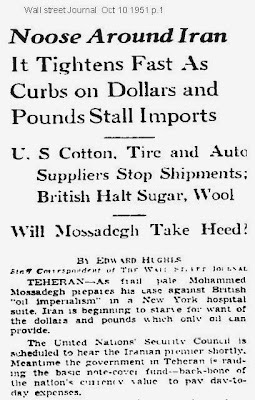 Bringing William Morgan Shuster and "The Strangling of Persia " in 1912 into play underscores that the American/Israeli policy on Iran is as evil and rapacious as the Russian/British version in the early 20th century. I think "they" migh be planning to sink the USS enterprise and blame it on Iran, thus drag the US into a war. Thanks, Nima. I don't know how you do it. Awareness of inhumanity comes at a price.// Mohammen Javad Larijani on Charlie Rose Nov 18, 2011; Rose (metaphorically) poked Larijani in the ribs & said, "they're running out of food, aren't they." Like that's a good thing. Larijani was flustered for a moment. My impression he couldn't believe anyone could be so coarse as to think it appropriate to starve people. It affirms my impression of the foundation of Iranian character -- Iranians are a people for whom hospitality is the premier virtue of human relationships. May the god of Zoroaster preserve Iran.